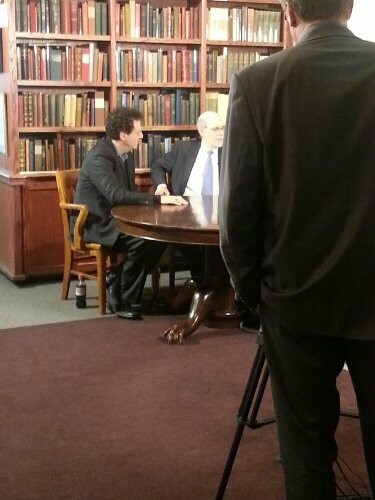 Watching a Pulitzer winner (among other awards, MANY others) discuss the importance of history is a beautiful thing. Knowing that he’s doing this out of a real love of the topic, a love for the people who understand Lincoln’s importance, and a sense of talking to the future… is downright inspiring. So glad to be in this room. I think my favorite quote today was when Kushner said Lincoln’s importance was not in being martyred, but in his powerful interest and patience, and ability to lead with compassion. That’s lovely, and I couldn’t agree more. It’s not the death that makes a legend. 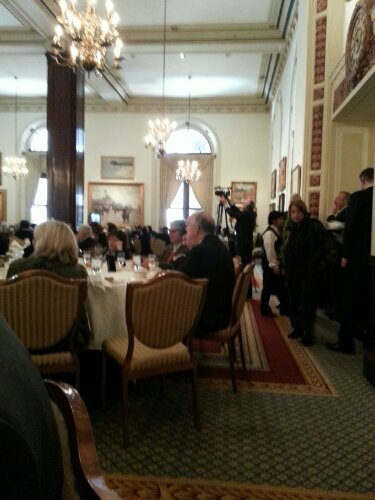 That was at the Union League Club earlier today. Picture! There you go! That’s the room, if not the man: I was working and couldn’t get in front of the film crew… sad. Other than that? Hope your day was as inspirational, mind-opening, and as much of a lesson in dignity, graciousness, and class as this has been for me. We had to pull Tony away from a group of college kids from Columbia College (just a few blocks away) or risk his enthusiastic and personal attention would make him late and get us in trouble. I felt the shame of it, believe me. This has been a truly fortunate learning experience and a look at a whole other kind of life. Rumor has it the Connecticut Question will be asked, but as I’m writing this, it hasn’t yet. I hope Mr. Kushner gets to give an answer that settles, finally, this issue. Zeitgeist rubbernecking aside, I can’t believe anyone thinks movies are historically accurate. Judge it by how the tale is told, peeps. FANA Kicks off New Campaigns With First Meeting! FANA Kicks off New Campaigns With First Meeting!. A Quick Note About The Growing Pawn Shop Question….